Introducing a unique spice appreciation and spice blending workshop with Ian Hemphill of Herbie’s Spices. Spices are quite literally On Trend as never before. We see spices in the majority of restaurant and café menus, the amazing colours and textures of spices feature in food magazines, and even restaurants and boutique food outlets call themselves by spice names to reinforce their foodie credentials. Nonetheless, mystery has surrounded spices, their origins and uses for thousands of years. 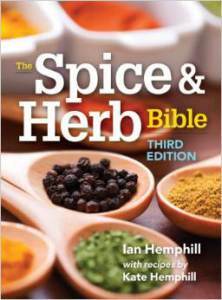 However, how much do you really know about these wonders of nature, and the best ways to buy, store and use them in everyday meals?In this workshop, Ian “Herbie” Hemphill, author of the award winning Spice & Herb Bible, will take you on a magical mystery tour of the world of spices. Workshop participants will learn just what spices and herbs really are, the different roles for using fresh or dried, and why most spices are dried to get their flavours. Importantly, spice blending will be explained, showing how 9 identical spices can be used to make four completely different spice blends. 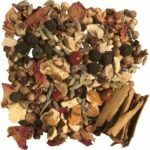 These blends will then be used hands-on when you collaborate to make four different recipes, featuring the flavours of Morocco, China, India and the Middle East. Herbie spent his childhood surrounded by herbs and spices, when his parents, John and Rosemary Hemphill, were pioneering the herb and spice scene in the 1950s. Forty Five years of working in the industry, including face-to-face lectures to groups from the general public, industrial brokering, manufacturing and marketing, has made Herbie a well-respected and popular figure amongst his peers, in Australia and overseas. He now enjoys sharing his extensive experience and knowledge with his customers at Herbie’s Spices. This is the comprehensive introduction to spices that almost needs no introduction! In this two-hour session, Ian Hemphill, otherwise known as ‘Herbie’ will navigate through the exotic waters of the history of the spice trade. You will learn about many different spices, their origins, and how they are processed and traded. 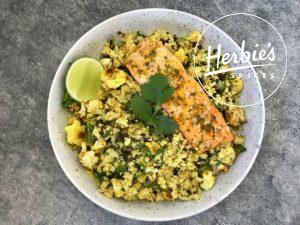 Most importantly, Herbie will de-mystify their flavours and explain the principles behind spice blending, so you will feel comfortable using them in everyday cooking. In addition to this Herbie will show you how to use his beautiful quality botanicals to create your own Gin at home. – An array of delicious spicy nibbles! The way popularity can start a race to the bottom! Let me begin by sharing my thoughts on Pot-Pourri, a now devalued and bastardised item. Some history: When I was growing up in my parent’s herb & spice business in the 1960’s, I would earn pocket money helping my father harvest scented plants to make his classic Pot-Pourri. 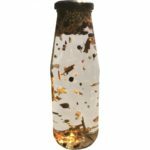 Pot-Pourri was a traditional blend of dried rose petals, scented geraniums, lavender flowers, lemon verbena, and any other seasonally available scented flowers and leaves. The alchemy that made this fragrant concoction last for years, occurred when Dad added ground cinnamon, cloves, and orris root powder with a few drops of natural essential oil of rose geranium. Imagine my horror when in later years I saw so-called Pot-Pourri in gift shops made with coloured wood shavings and artificial fragrances! My distress was compounded when a room freshener was launched in a pressure pack, and it was called Pot-Pourri. 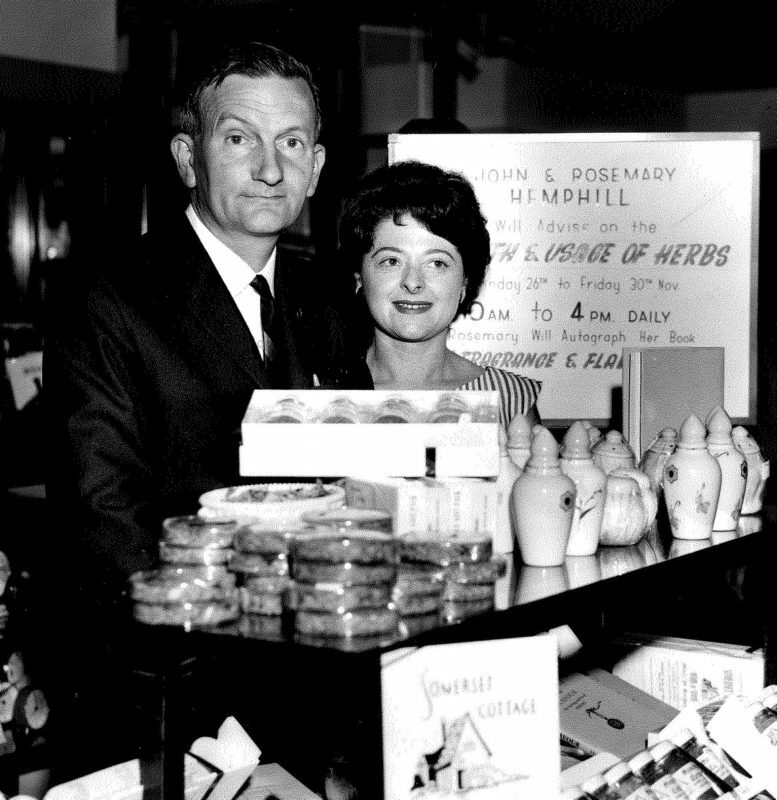 My parents, John & Rosemary Hemphill talking herbs and spices in the 1960’s and selling Pot-Pourri in locally made ceramic pots. I use this as an example of how easily something precious can be devalued and ultimately ruined because it became popular. This traditional Moroccan mix is the pinnacle of all spice blends. The sometimes more than 20 ingredients merge to form a balanced, full-bodied blend with no sharp edges. It is arguably the finest example of how well a collection of diverse spices can form a blend immeasurably greater than any of its individual parts. 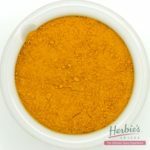 At Herbie’s Spices we carefully blend our Ras el Hanout, using over 20 spices including whole Kashmiri saffron stigmas, and add no salt, fillers or artificial ingredients. 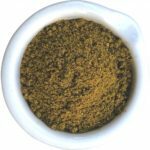 On the one hand it is great to see how popular Ras el Hanout has become, the downside is that due to its popularity many spice companies in Australia, the USA, Europe and the UK are making greatly inferior versions. I’ve seen many that only have about 10 ingredients, and in addition salt and onion powder! A true Ras el Hanout can even be used in a sugar syrup to spice orange segments, a great dessert to have after a Tagine. You wouldn’t do that with these compromised versions. Firstly, read the ingredient list on all spice blend labels, and be suspicious of those that just end the list with the word “spices”. 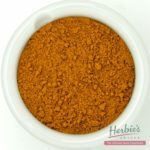 At Herbie’s Spices we always list 100% of the ingredients on our blends, so you know exactly what you are getting. (The quality of the ingredients makes a significant difference as well). For more information about the art of spice blending, and recipes for over 60 spice blends, see The Spice & Herb Bible 3rd Edition by Ian Hemphill with recipes by Kate Hemphill. Published by Robert Rose Inc. Toronto, Ontario, Canada. Food safety … food security … everyone hears the term, but unless you’re in the industry, you don’t quite know what it means. So let us fill you in on just what is involved in keeping your herbs and spices the way you want them to be. Certification by HACCP is the first step. The letters stand for Hazard Analysis Critical Control Point, and means that risks are assessed and pre-empted before problems occur, using a paper trail that ensures that everything is accountable and traceable. Quarantine of allergens is a good example … we have a dedicated mixer in a separate area, used only for nut and sesame mixes such as Dukkah and Za’atar, and nut raw materials are kept in a separate quarantined area shut away from all our other herbs and spices. A total clean-down process follows immediately after packing any products that contain possible allergens. Allergens such as gluten are measured in parts per million. If any trace is found, it must be declared (in other parts of the world, a small leeway is allowed). So if you can imagine three grains of wheat amongst one million coriander seeds, that’s enough to mean that our labeling must show that presence as “may contain traces of gluten”. This tiny amount can be due to wind-borne glutens when a field of wheat is nearby to a field of coriander. We are constantly vigilant with our incoming goods, as we are in an industry that is older than the Bible, and full of tricksters and age-old adulteration practices that are only slowly reducing. 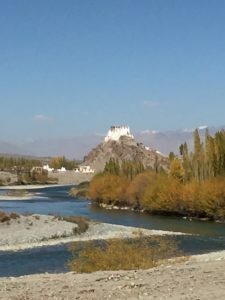 Trusted suppliers send their goods with a certificate of analysis, but sometimes the more unusual spices come from very remote rural areas where this is not possible. Analysis of imported materials is an ongoing cost for us, in order to be sure that we are worthy of the trust you put in us. 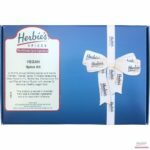 What’s new at Herbie’s? We’ve been busy creating a truly magical Rose Harissa – if you love our original Harissa, you’ll find this one a little milder and more complex. Use it to make a sauce, or mix to a paste with oil and water and spread onto chicken before roasting or steaming. Also new, by special request, is Bill’s Steak Rub, in honour of our Californian stockist, Bill Williamson (see more later). It’s his favourite combination of porcini powder, pepper, onion, garlic and paprika for the perfect barbecue result. There are two new spice kits in time for your Christmas shopping … or shopping for yourself and your family. 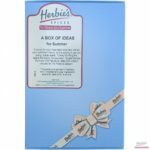 The Box of Ideas, as always, brings new and different products to you every season. This Summer we’re looking at classic favourites that are appropriate for Christmas … Turkey Stuffing Mix, Gunpowder, Quatre Epices Savoury, Apple Pie Spice, and Satay Spice Mix. You’ll have all your holiday catering solved, for the modest cost of $25.00 plus postage. 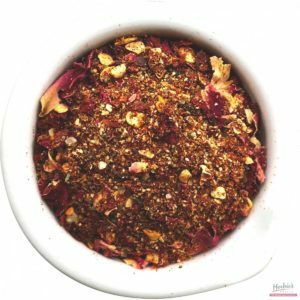 Also sparkling new is our blue Vegan Kit, full of delightful healthy recipes enhanced by our Yemini “Hawaij” Mix, Furikake Seasoning, Bread Maker’s Seed Mix, Barberries, Korma Curry Mix and Ras el Hanout Super. 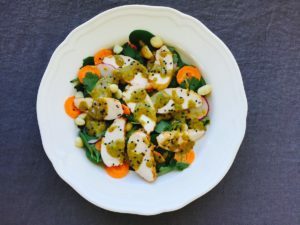 Recipes include Pea Hummus with Seeded Crackers, Super Noodle Salad, Hawaij Roasted Carrots and lots more delicious meals. You don’t have to be a committed vegan to love this kit in our $38.00 range – it’s all delicious! We also have good news for gin makers … diced orris root. You can now make your own gin without the cloudiness of a powder. So when you draw that person-who-has-everything in your Kris Kringle, and you opt for our Ginspiration Kit, the diced orris root will be a star inclusion in the kit. 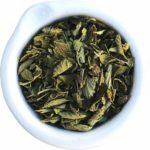 There have been cries of shock and horror when it’s discovered that things are not what they seem – the oregano adulterated with olive leaves some time ago, and more recently the honey that proved to be not quite all honey. Look at it this way … when supermarkets promise ever-cheaper prices, and consumers want to pay less and less, it’s a case of getting what you pay for. When a producer is forced to sell a product for less than it costs to produce, naturally, that producer will minimize the cost by adding a cheaper component, or go out of business, leaving a team of blameless workers out of work. The ball’s in the court of the consumers. Over 21 years, a chap’s allowed to change his mind, right? 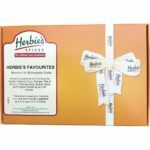 Herbie has reviewed his Herbie’s Favourites kit, after over 15 years, to reflect his all-time favourites, in his favourite curry-coloured box, it’s now $38.00. We recently paid a visit to our Californian stockist, Williamson Wines, in the pretty village of Healdsburg. It’s always refreshing to see a different take on the use of spices and blends … for instance, a marrying of horseradish and Shichimi Togarashi coating a thinly-sliced steak fillet. What a fantastic and unexpected use for a blend that we had always expected to see used mostly with seafood! Cajun spice mix used on chicken wings with mirin and sesame oil was another delightful surprise. These fresh looks at old favourites can remind us all to keep our minds open to new possibilities at all times. 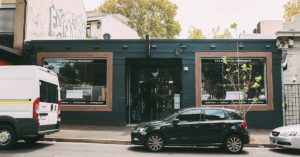 Are you a Rozelle local? We’re going to be in Rozelle at The Essential Ingredient’s Christmas bash on 29th November, from 5.00 to 8.00pm. We’ll be showcasing our Ginspiration gin, and showing you some quick dip ideas for your entertaining season. We wish you all the very best for your Christmas and holiday season. 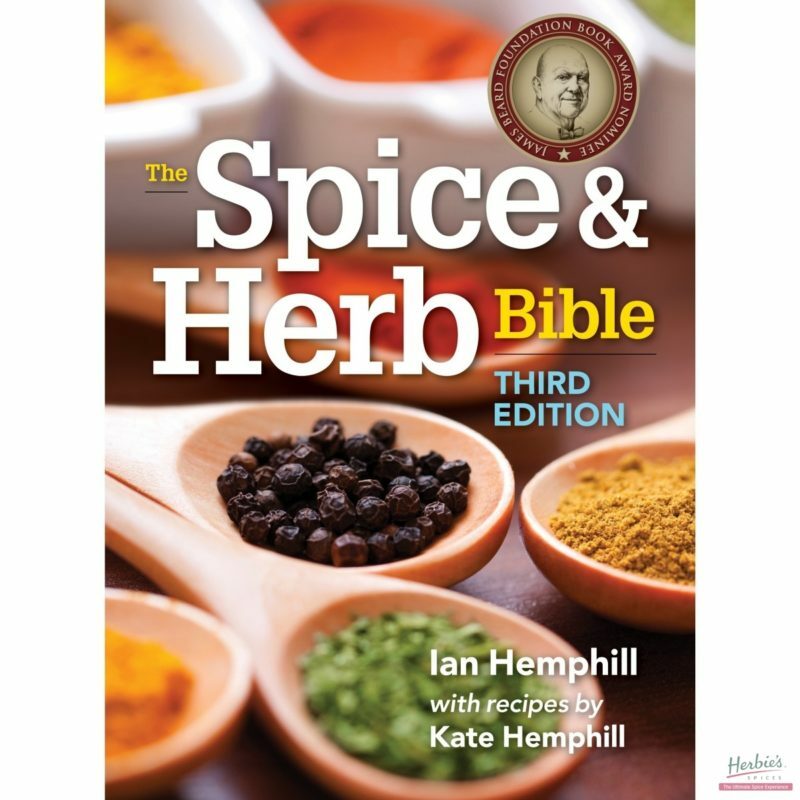 Join Australia’s spice guru Ian ‘Herbie’ Hemphill and daughter Kate (authors of The Spice & Herb Bible 3rd Edition) in this hands-on class to explore the colourful and vibrant world of spices. Learn how spices bring readily available ingredients to life, including the art of making your own spice blends. This will be the only hands-on Herbie’s course we will be running this year due to Kate’s schedule in the U.K so book early to avoid disappointment! 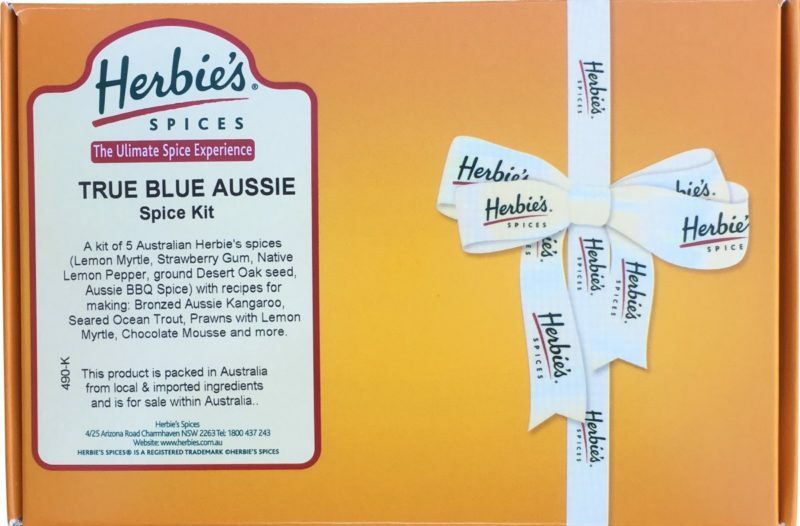 Herbie has long been the nickname of Ian Hemphill, one of Australia’s foremost culinary herb and spice experts. 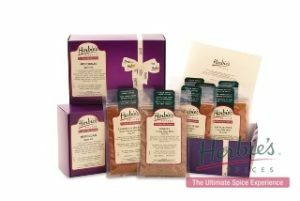 Herbie and wife Liz started Herbie’s Spices in 1997, and after Forty-Five years of working in the herb and spice industry, Herbie is a well-respected and popular figure amongst his peers, in Australia and overseas. Kate Hemphill, Ian & Liz’s eldest daughter, is an accomplished cook, a graduate of Leith’s School of Food and Wine in London, recipe contributor to The Spice & Herb Bible, and developer of most of the inspirational recipes you will find on www.herbies.com.au website. 2. The Essential Ingredient reserves the right to alter or cancel a class without notice. In the event of a change, you will be contacted on the daytime phone number provided to us at time of booking. 3. Registration is from 30 minutes prior to the class start time. 4. All classes and events require closed-in shoes. 5. We cannot accommodate dietary requirements in all cases. Please contact us prior to booking on 02 9555 8300. What do you think of when you hear the word Curry? Does the image of a big pot of a protein swimming in lots of delicious rich gravy, served with rice and pappadams, come to your mind? When a curry powder is made, it is basically a spice mix, just as Baharat, Chermoula and barbecue blends are spice mixes. 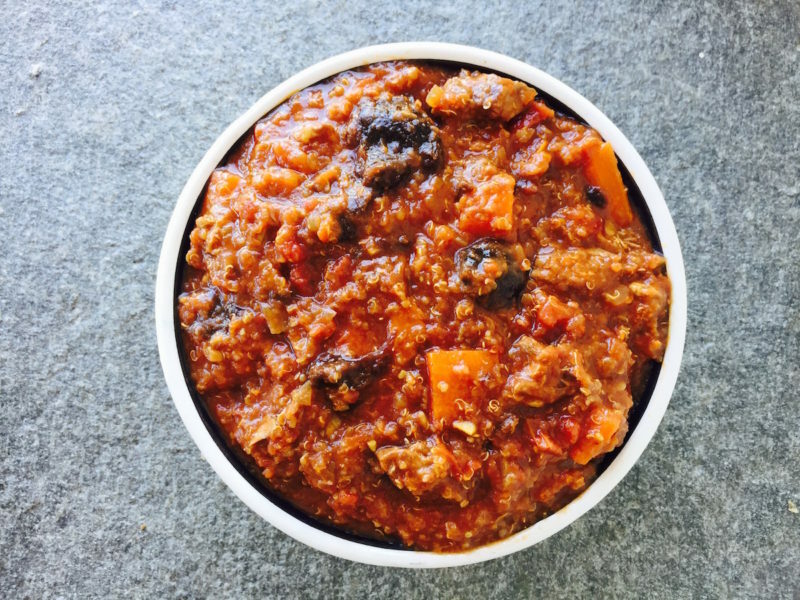 Don’t let yourself be restricted by preconceived ideas when you see a curry blend … use it to flavour a mayonnaise for salads, add it to your home-made vegetable soup, or use it to season the chops on your barbecue. (Don’t forget to add salt!) You’ll love the discoveries that come your way when you open your mind to wider horizons. When we look back on the food scene of 2018, the one ingredient that will stand out will be turmeric, which is being touted as a wonder food that will keep us all alive and well forever. These health claims are based on the component curcumin which is believed to have anti-inflammatory and other properties. What is not mentioned so often is that there are two types of dried turmeric powder … Madras turmeric, which is a sunshine yellow powder best used for its mild flavour and colouring capabilities, with a curcumin content of around 3.5%; and Alleppey turmeric, a rich orange colour with an oilier feel (it will roll itself into little balls if you swirl some around in a bowl), an earthier flavour, and up to 6.5% curcumin content. So, if you are looking for a health benefit, make sure you ask for the right one. We advise against expecting miracles. Use it in normal culinary applications, and don’t overdose! Because of its robust flavour, Alleppey turmeric is our preferred one to use when we are making blends such as Chermoula and Persian spice mix. While we’re on the subject of turmeric in your diet, if you’re looking for easy ways to include it, don’t forget our turmeric-rich blend called Tempero Baiano – not a common name, as it’s a South American blend. 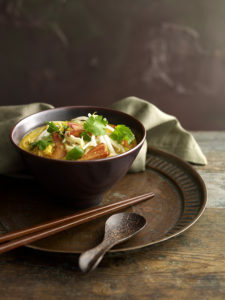 There’s a great seafood stew recipe on the back, and we love to add it to our home-made soups. You’ll also find Turmeric Chai and Turmeric Seafood Rub to enhance your healthy diet. Herbie’s has just had its twenty-first birthday … my, how the time has flown, and what good fun we have had! 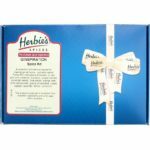 In this current anti-plastic bag age, we are proud to say that, for all these years, our Herbie’s Spices retail carry bags have been paper. The fact that our beautiful products are packed in a high-quality plastic zip-lock bag with low oxygen-transference is because it’s the very best way for you to store your spices to keep them at their best. 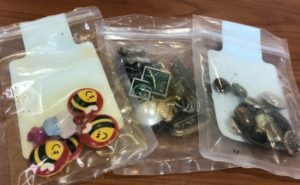 But they are not single-use bags: in our house, you’ll find Herbie’s zip-lock bags keeping buttons organized beside the sewing machine, different-sized screws tidily separated in the workshop, and rings and brooches neatly stored and easily found. The empty bags are easy to wash, and you’ll find that, once you manage to prise up one corner of the label, it peels off easily. Tell us how you use your empty Herbie’s bags! Did you enjoy the Winter Box of Ideas, and the way it expanded your repertoire of delicious warming meals? 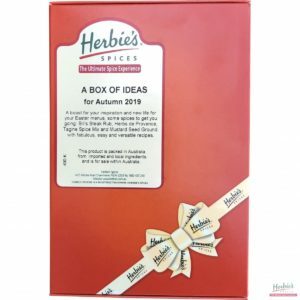 The reasoning behind the regular Box of Ideas is that it can work like a spice club, a new one for every season, but without tying you in to an annual club subscription. No product is ever repeated, so you can accumulate a wide range of spices by investing $25.00 four times a year. Our pretty spring-green box for this season contains Barberries, Desert Oak Ground (an Australian native you may not have met before), Italian Herbs and the delicious new Kashmiri “Basaar” curry, to bring you salads, comfort foods and more to see you through spring, that most changeable of seasons. What’s new at Herbie’s? There are so many wonderful ways of combining spices in different parts of the world (see our South American Tempero Baiano, mentioned above), and we’ve had customers ask for a Yemeni Hawaij spice blend. We’ve been happy to oblige, and this richly peppery spice mix is a hit as a seasoning for our winter lentil/vegetable stew, although more traditionally used with foods like fried chicken. The main ingredients in the blend are black pepper, coriander, cumin and turmeric, with sparky elements of caraway, ginger, cardamom, cinnamon and cloves to give it life and balance. We’re also pleased to announce the arrival of true Mexican oregano. Whilst our Australian-grown oregano has always been a perfectly adequate replacement, the Mexican has a different botanical name Poliomentha longiflora. Now your Mexican cooking can be truly authentic! The vanilla problems mentioned in previous newsletters continue to bother us. Isn’t it great that we have discovered other ways to make our sweet foods interesting? If you don’t have vanilla, use a little ground star anise, fennel pollen or ground cardamom seed to enrich your custards, ice creams and desserts. Sometimes the number of spices on offer can be daunting. There are just so many, and there are lots of names that aren’t familiar. If you feel a bit overwhelmed by it all, or you know someone who feels that way, there’s a part of our user-friendly website that can really help. On our home page, you will find, on the right hand side of your screen, “Herbie’s Q&A Videos – filmed in the USA”. You’ll feel as though you are having a conversation with Herbie, as he answers all your questions. This is your chance to talk about spices with Australian spice guru, Ian Hemphill of Herbie’s Spices. Herbie is the author of the award winning Spice & Herb Bible, an authoritative herb and spice treatise sold in Canada, the USA, the UK and Australia. Copies will be available for sale and signing by Ian on the day. The history of the spice trade and the Hemphill family’s obsession with herbs and spices for over 50 years. The difference between a herb and a spice. Vanilla, how it is grown and processed. Storage, how to store and what does shelf life actually mean? Quality and Adulteration, what is quality, how to identify and why it is important? Herbs and spices are key to healthy, sustainable diets. Cinnamon and cassia, what’s the difference and why you need to know. Pepper, once the world’s most traded spices. Chilli and all its derivatives, unknown to India, China and Europe only 500 years ago. 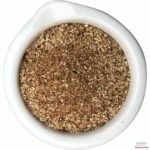 Ras el Hanout the most exotic Moroccan inspired spice blend on Earth. 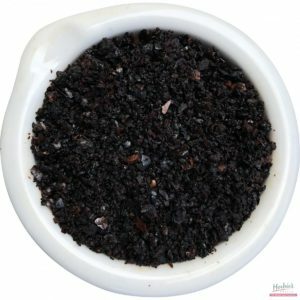 Fragrant Sweet Spice, is another exotic blend for everyday use. We have recently noticed an increase in awareness of mastic as an ingredient, so have decided to share some previous information to help demystify this fascinating and useful spice. Mastic is the name given to the resinous gum that exudes from the scored bark of the Gum Mastic Tree. There are many varieties of mastic trees (Pistacia lentiscus) in the Mediterranean and Middle East, yet most of the world’s production of gum mastic comes from the “Protected Designation of Origin” trees (P. lentiscus var. Chia) that grow on the Greek island of Chios. The name mastic derives from the Greek word mastichon which means to chew. 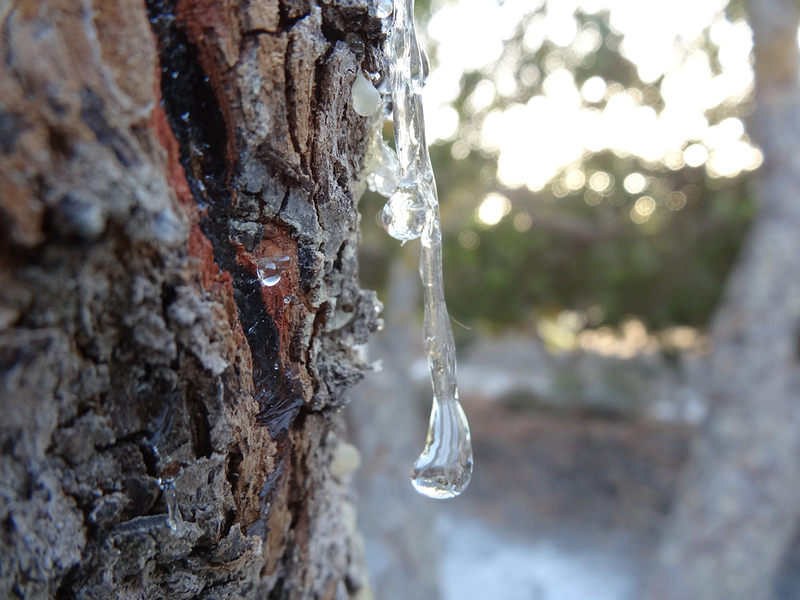 Mastic has a slightly resinous, pine-like flavour and can be chewed just like chewing gum. Mastic is used in cooking for the consistency it gives to Greek slow-cooked lamb, it is used in ice cream and in The Spice & Herb Bible there is a recipe for an Asparagus and Mastic Summer Soup. Between June and September, Mastic farmers ‘hurt’ the trees by scoring the bark. The tears that ooze out in stalactite-like strands fall onto white kaolin clay that has been spread on the ground below the trees. This promotes drying and contributes to the clarity of the mastic that falls onto it. In this grove of gum mastic trees you can see the white kaolin clay that is spread around the base of the trees prior to scoring the bark. The gathered mastic is then stored in cellars to further solidify, and during winter, families in the mastic villages clean and grade the resin into different sized ‘tears’ ready for sale. 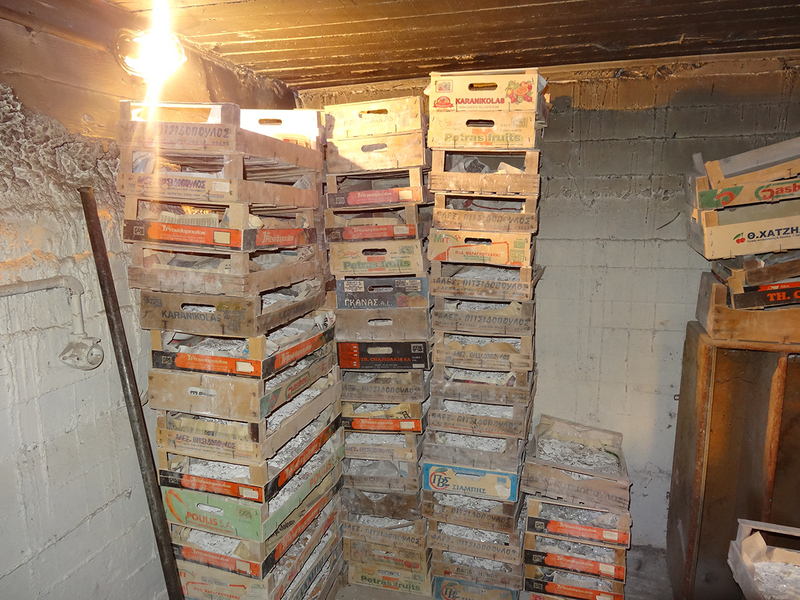 Mastic stored in a cellar ready for cleaning and grading in winter. These are the mastic tears we sell at Herbie’s Spices. The gum mastic tree, or schinos as the Chia variety is called in its native Greek island of Chios, is a slow-growing, hardy evergreen tree that averages 2–3 m in height, although some have been known to reach 5 m. The mastic tree has shiny dark-green leaves, resembling those of myrtle. The trunk is rough and gnarled and when tapped yields a clear resinous substance which when coagulated is called gum mastic. 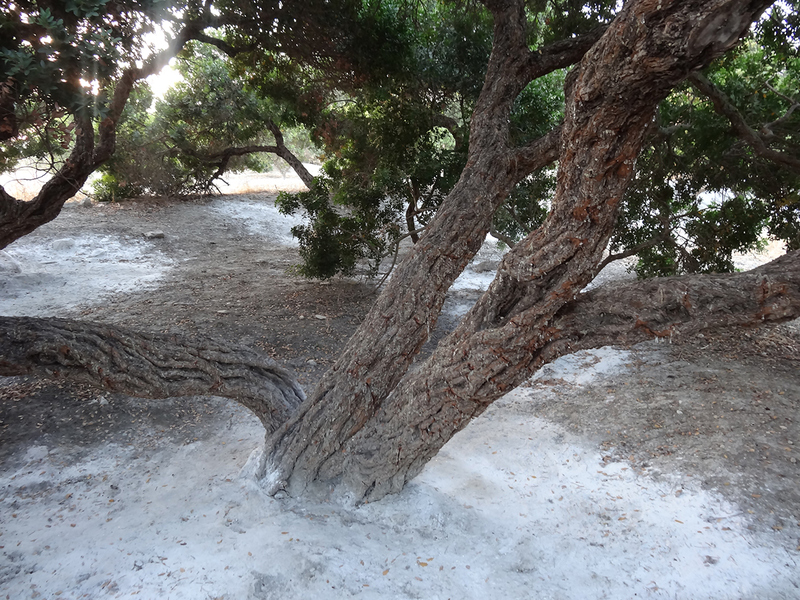 The valuable gum mastic flows when the grey bark has been cut, or ‘hurt’, to tap the supply. Full growth of these charming trees is achieved after 40–50 years, and some trees are known to be up to 200 years old. Mastic production commences when the trees are five to six years old, reaching maximum yield of up to 1 kg per tree when the tree is 15 years old. The end of a tree’s productive life comes at about 70 years of age. The sappy gum hardens after ‘hurting’ and is most often seen in either large (3–5 mm) or small (2–3 mm) pieces, referred to as ‘tears’. The texture of these tears is brittle and somewhat crystalline. When broken, mastic tears reveal a shiny surface resembling a piece of chipped quartz and release a faint pine-like aroma. The flavour is initially bitter and mineral-like, becoming more neutral after a few minutes chewing, when it takes on the consistency and opaque fawn colour of chewing gum. Even after 15–20 minutes chewing, a surprising degree of mouth-freshening flavour remains, unlike today’s highly flavoured chewing gums, which seem to expire in a matter of minutes. In cooking mastic does contribute to flavour although its main function is for texture and as a binding agent. 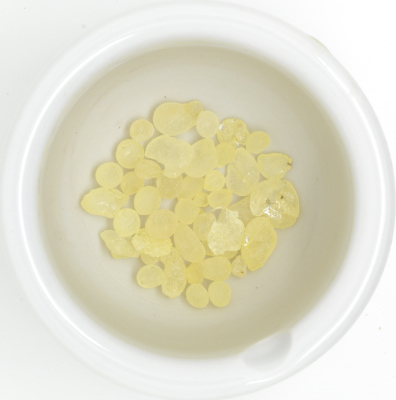 A gum mastic oil is also produced by distillation of the leaves and branches of mastic trees, however, few cooks would be familiar with it as its primary use is in the manufacturing of sweets, liqueurs and medicines. One legend, which I feel is particularly appropriate, has it that when Saint Issidoros was tortured to death by the Romans in AD 250, his body was dragged under the mastic tree. Upon seeing the saint’s mutilated form, the tree started to cry with real tears. There are many varieties of mastic trees in the Mediterranean and Middle East, yet most of the world’s production of gum mastic comes from the Greek island of Chios, where an unsurpassed passion and dedication to the gum mastic tree is evident, and there is even a Gum Mastic Grower’s Association. Mastic has a long history that dates back to classical times and is mentioned by erudite Greek authors such as Pliny, Dioscorides, Galenus and Theophrastus. Mastic was well known to the pharaohs, and was mentioned by Hippocrates (the ancient doctor known as ‘the father of medicine’) as a cure for all manner of ailments from baldness to intestinal and bladder problems, as a paste for toothache and to apply in cases of snakebite. Today the Gum Mastic Grower’s Association lists 64 uses for mastic, extolling among other things, its anti-cancer properties, use in treatment of duodenal ulcers, benefits for oral hygiene and use in South Morocco and Mauritania as an aphrodisiac. Production of gum mastic is still strictly controlled and occurs between June and September. This begins by first cleaning and levelling the ground around the base of the trees with white clay – called ‘currying’. The white clay contains limestone, which promotes drying and contributes to the clarity in mastic that falls onto it. The first cutting, or ‘hurt’, of 10–20 wounds is made on the trunk, typically in the morning, which is the best time for maximum sap flow. Up to 100 cuts are made over the season, however, too much ‘hurting’ of young trees will inhibit future yields. Over the next 10–20 days, coagulation takes place as gum mastic oozes out of the cuts. The tears are collected, first using a special tool called a ‘timitiri’ to remove them from the trunk. The rest of the mastic on the ground is collected, put into wooden crates and transferred to the houses where it is sorted, ready for cleaning by the village’s womenfolk during winter. After sieving to remove any adhering leaves and soil, the gum is washed in cold, soapy water, rinsed thoroughly and spread out on bags inside the houses to dry. After drying, a small knife is used to remove any remaining dirty particles. Much of the winter in the mastic villages is spent carefully cleaning the summer’s production by hand to prepare it for sale. Clean gum mastic is categorised into three main grades. ‘Pitta’ is the foam that occurs when many drops become one; this grade is the largest (pieces up to 7 cm in diameter) and has an oval shape. Next are large tears, which measure about 10–15 mm in length, and small tears that average 3–6 mm in diameter. Tiny pieces are classified as powder, and any uncleaned remains left over are usually distilled for use in perfumes and alcoholic drinks, such as ouzo and raki. Gum mastic can be purchased from Greek and Middle Eastern food stores and specialty food retailers. The most common pack size is 1–5 g because it is relatively expensive and a recipe only requires a small amount to be used at a time. Tears should be quite clear and transparent with a slight golden tone. The best storage conditions are in a cool place, as exposure to extreme or prolonged heat will cause the tears to become cloudy and discolour, with a subsequent loss of flavour. Mastic appears to have myriad applications ranging from the medicinal to the functional, including use as a stabiliser in paints, and for making varnishes, especially for musical instruments. It has been used in the production of tyres, aromatic soaps, insecticides and electrical insulators. Frankincense is produced from gum mastic and rosin, and mastic has been used in the tanning, weaving and bee-keeping industries. Where mastic really shines of course is when it comes to culinary uses. Besides being used in toothpaste, chewing gum and confectionery, it is an ingredient in the making of liqueurs. Included in the best and most authentic Turkish delight, it is found in recipes for breads and pastries, ice-creams, sweet puddings and almond cake. Source: The Spice & Herb Bible 3rd Edition by Ian Hemphill with recipes by Kate Hemphill. Published by Robert Rose Inc. Toronto, Ontario, Canada. Herbie visits Chios, the home of Gum Mastic. Ian & Liz Hemphill will be visiting Matters of Taste Cooking School in Western Australia on 2nd June 2018 to entertain and inform about the world of spices. 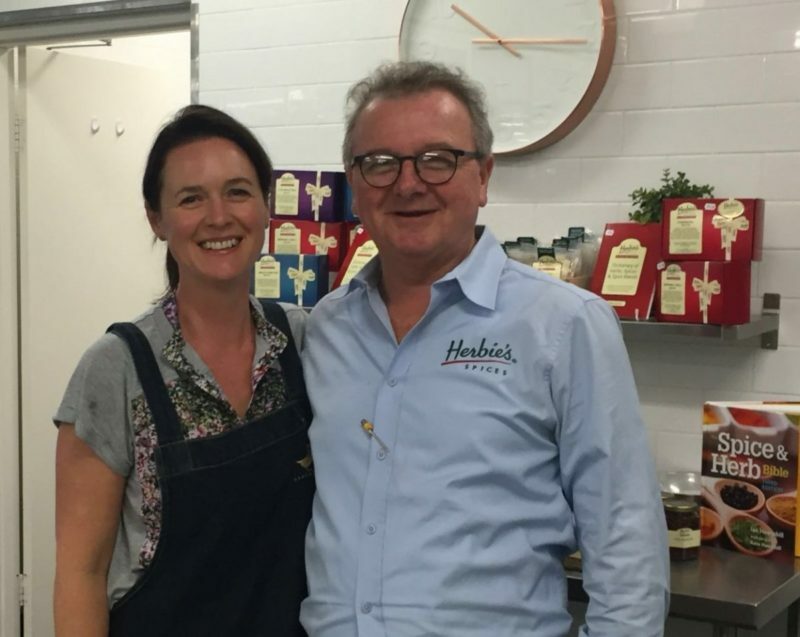 Ian (Herbie) and Liz Hemphill are the gracious owners of the iconic Herbies Spices based in Sydney. If you want to know anything about spices, they are the perfect people to answer your questions. With seemingly infinite knowledge, they join us for Spice Mastery. Over forty five years of working in the industry, including face-to-face lectures to groups from the general public, industrial brokering, manufacturing and marketing, has made Herbie a well-respected and popular figure among his peers, in Australia and overseas. 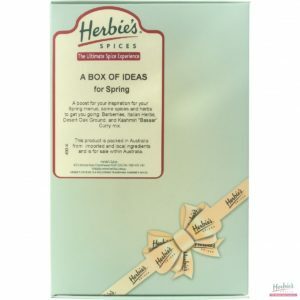 We use Herbies Spices in class to make our food taste exceptional. Ian and Liz will take you on a fascinating and mind-boggling journey into the mystical world of spice. From Ian’s childhood growing up with his spice pioneering parents in the 50’s, to travels around the globe in search of stunning produce, Ian and Liz have many stories to tell. Delight in this fabulous 3 hour class and leave with a greater knowledge of how to exquisitely spice up your cooking! 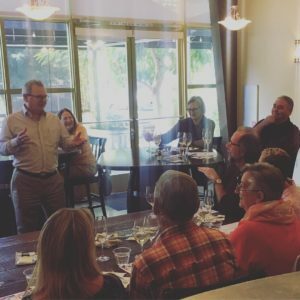 Class: Spice Appreciation Saturday Afternoon EVENT June 2nd 2.30pm to 5.00pm – 40 participants, row seating, Demonstration Style, Tastings included $89.00. Whilst we endeavour to accommodate food preferences and allergen avoidance, some classes are not suitable for participants with life threatening reactions. You are welcome to contact us for any further clarification and to ask further questions regarding the suitability of this one-off class content.